But it’s often difficult to get recognition for skills and achievements gained outside of school. 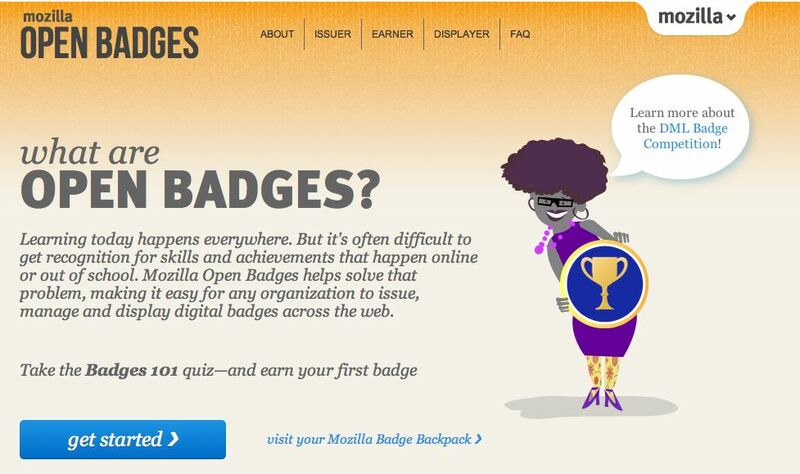 Mozilla’s Open Badges project is working to solve that problem, making it easy for any organization or learning community to issue, earn and display badges across the web. The result: recognizing 21st century skills, unlocking career and educational opportunities, and helping learners everywhere level up in their life and work. The web and other new learning spaces provide exciting ways to gain skills and experience—from online courses, learning networks and mentorship to peer learning, volunteering and after-school programs. Badges provide a way for learners to get recognition for these skills, and display them to potential employers, schools, colleagues and their community. Using Mozilla’s Open Badge Infrastructure, any organization or community can issue badges backed by their own seal of approval. Learners and badge earners can then collect badges from different sources and display them across the web—on their resume, web site, social networking profiles, job sites or just about anywhere. By displaying skills and achievements that traditional degrees and transcripts often leave out, badges can lead to jobs, community recognition, and new learning opportunities.